Kind of Blue is a studio album by American jazz musician Miles Davis, released on August 17, 1959, by Columbia Records. Recording sessions for the album took place at Columbia's 30th Street Studio in New York City on March 2 and April 22, 1959. The sessions featured Davis' ensemble sextet, with pianist Bill Evans, drummer Jimmy Cobb, bassist Paul Chambers, and saxophonists John Coltrane and Julian "Cannonball" Adderley. 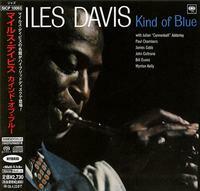 After the entry of Evans into his sextet, Davis followed up on the modal experimentations of Milestones (1958) by basing Kind of Blue entirely on modality, in contrast to his earlier work with the hard bop style of jazz.